A veteran Mars probe received a two-year missionextension though Sept. 2010 to keep watch over the red planet. 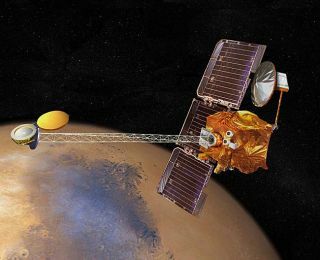 NASA's Mars Odyssey represents the longest-serving of sixspacecraft currently orbiting Mars, after first reaching the planet in 2001. Itsnew extended mission requires changing orbit to gain a bettervantage point for doing infrared mapping of Martian minerals. The first year of the two-year extended mission carries aprice tag of $11 million through Sept. 2009, said Guy Webster, NASA spokesperson at the Jet Propulsion Laboratory (JPL) in Pasadena, Calif.
An orbital adjustment should allow Odyssey to look downat sites in mid-afternoon rather than late afternoon. The spacecraft's thermalcamera could then better detect infrared radiation from warmer rocks to betteridentify them. "This will allow us to do much more sensitivedetection and mappingof minerals," said Jeffrey Plaut, a Mars Odyssey scientist at JPL. However, the shift to mid-afternoon is also expected tohalt usage of an instrument in Odyssey's Gamma Ray Spectrometer. The gamma raydetector requires the later-hour orbit to avoid overheating a criticalcomponent. Odyssey began its course change by firing up itsthrusters for almost six minutes on Sept. 30, the last day of its secondtwo-year extension. "This was our biggest maneuver since 2002, and itwent well," said Gaylon McSmith, Odyssey mission manager at JPL.? "The spacecraft is in good health. The propellant supply is adequate foroperating through at least 2015." The spacecraft's orbit is synchronized with the sun, sothat local solar time on Mars has been about 5 p.m. wherever Odyssey flew overfrom the north pole to south pole. On the flipside, local time has been roughly5 a.m. as the spacecraft flew from south to north. The time should gradually change to somewhere between2:30 p.m. and 3 p.m. over the next year or so, as Odyssey's overhead pass getsearlier by about 20 seconds per day. Odyssey's overall mission so far has helped detect largequantities of water-icenear the surface in the higher latitudes of Mars, which led to NASA's PhoenixMars Lander mission. The spacecraft helped keepan eye on Phoenix as the lander descended to the surface, and continues torelay information from Phoenix back to Earth.